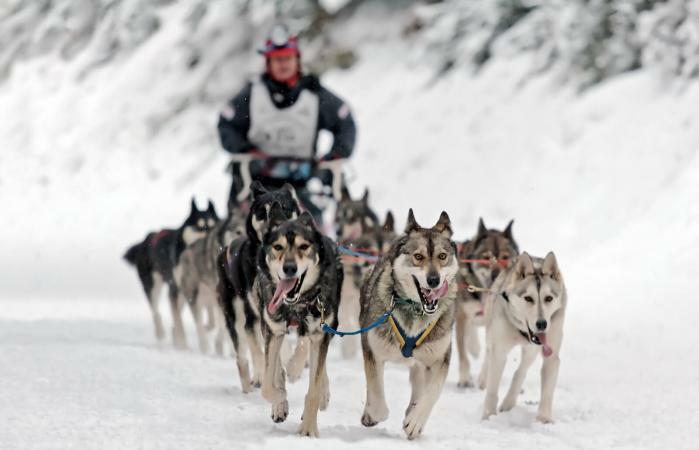 Training a sled dog should begin early in the life of a canine athlete. A strong foundation of training and socialization will foster a dog's ability to pull a sled and create a confident adult sled dog. Handle them regularly on all parts of their bodies. Place a collar around their necks and allow them to drag a lightweight leash for a few minutes every day. Always use a buckle collar with sled dogs as other types of training collars made of metal can be dangerous for the dog during racing if it becomes caught. By the age of ten weeks, you will begin more acclimation to the sled dog harness and obedience training. Put them in a harness for a brief time daily for a few minutes. You can tether him to a solid object and place his food bowl on the ground in a way that will cause him to strain against the tether. This will help him to become comfortable with the harness being tight across his chest and help him learn the "line-out" command. When the puppy is about four months old, he is ready to pull a lightweight object that does not bounce around as it goes over the ground. Many mushers use a track from a snowmobile for this purpose. Another example would be a lightweight board or a log. First find a suitable place for them to train. The surface must be appropriate for keeping their feet and joints in good condition. Dirt or grass is an option, or gravel. Avoid concrete, roadways, and pavement. Attach a "drag line" to the puppy. This is a long leash from 15 to 20 feet in length. This line is hooked to the harness and tied to a stake. Encourage the puppy to run pulling the item and once he seems to understand the task, add in your cue word when he takes off. "Hike" is commonly used, but you can use any word you like as long as are 100 percent consistent with it. You don't want your puppy to over-exercise themselves so do this step in small sections of about 50 feet. Call out your stop word and put your foot over the drag line. Many mushers use "whoa" for this word but again, you can use another word but use it consistently. Some puppies take off with glee during this exercise; others may take some coaxing and patience. It is best to move slowly during this part of training. If your dog doesn't have a natural inclination to pull or move away from you, try encouraging them to move forward with something they like, such as a toy. Use an excited, happy tone of voice and encourage them to pull forward. You may need to stand in front of him for this until he understands what you want. If the puppy is frightened while pulling, he may be ruined as a sled dog prospect. You can use positive reinforcement to acclimate him to pulling and move at a slower pace to accommodate the dog's personality. Realize not every dog is suited for sledding. Do this pulling exercise until the pup seems comfortable pulling something behind him and keeping the line taut. When your puppy is running with the weight behind them happily, you want them to start to run ahead of you. Once the pup is listening to his basic obedience cues reliably and is doing well with his harness training, you can start to train the behaviors he will need to know as a working sled dog. The commonly used cue words for making turns are "gee" for a right turn and "haw" for a left turn. Start out training in a low-distraction area. Lure the dog around your body with a piece of food in both directions. You can also lure them around something, like a chair or garbage can in front of you. Reward them for following your hand each time with the food treat. Now do the same luring motion with your hand but without the food in it. Reward the dog for continuing to follow you left or right. Add the cue word in when the dog is following your hand. When the dog is doing well, take them to a more distracting area, such as outside in the yard or around other dogs and gradually build up their following the cue word reliably. Attach the dog with a harness to your pulling object or sled and work on them slowly with following the cue. Dogs can get distracted as they're running by objects like a squirrel or deer in the woods, or by another dog team going by. They need to learn a cue to ignore these distractions and keep going. The cue for this is typically "on by." A similar cue is "leave it," which means to leave an item alone if, for example, your dog does wander off to begin investigating a squirrel. Some people teach these separately or just use one cue since it's a similar behavior. To train a dog to leave it, present them with a tasty treat in your hand and then close your fist. Have treats ready in your other hand behind your back. The dog will bump at your fist trying to get the treat. When he moves away from the hand, even if it's just a few hairs away, praise him (or click) and give him a treat from your other hand. Repeat this process until the dog "gets" the game. Now add in the cue word "leave it" and repeat the process. Eventually work up to putting the food on the ground and asking your dog to leave it. Once the dog is doing this reliably, take them outside where there are more distractions, and build up the cue using other objects they might want, such as going to see another dog, chasing after a squirrel, or a toy. You can then add in the harness and sled and practice this behavior. It's easiest to do this with another handler who can be in front of your dog to reward him while you monitor from behind with the drag line. Before your dogs come to a full stop you want to teach them to slow down as well as at other times where going slow is better for the track. The word used most often for this is "easy." This is best taught with the dog pulling a light object and with a handler to help you. The handler will be out in front and as the dog runs to them, you want to pull back gently on the drag line. As the dog slows down, the handler can walk to them and reward with a treat. Practice this and once the dog learns tension on the leash means slow down, add in the cue word. Repeat and gradually vary when your handler assistant gives a food reward and slowly phase it out. This step requires moving slowly. You don't want to put a bunch of dogs together at once, which can be overwhelming and may cause fights and stress. Start with only two dogs. Harness them up to a light pulling object or sled. It helps to have a handler assist you. One person will be out in front coaching the dogs to move forward to him or her. The other stays behind watching the sled/object and holding the drag line. The dogs should be rewarded for pulling the sled forward in small increments and gradually increase the distance that they pull. Once you are doing well with the two dogs, you can add in a third dog, but go back to the beginning step and then repeat. Remember to be patient and start small and slowly build up the behaviors. These are just the basics of how to train your sled dog. You can find an experienced handler to apprentice under if you want to learn more about this exciting sport.